BALTIMORE – Good morning from the Premier See… and at long last, How. Sweet. It. Is. Two years of fevered local expectation finally reached their close at Roman Noon this Monday, as the Pope appointed Monsignors Adam Parker, the 44 year-old archdiocesan Vicar-General and Moderator of the Curia, and Mark Brennan, 68, a priest of Washington serving until now as pastor of St Martin of Tours parish in suburban Gaithersburg, as auxiliary bishops of this mother-church of the United States. While the spike in Latinos has made for sudden booms in several city parishes, today’s picks come at a moment which finds even more of John Carroll’s church facing the other end of the scale. As final proposals are submitted over the coming weeks, the first half of 2017 will bring Lori’s decisions on a years-long parish planning process that’s expected to yield a substantive amount of realignment to the existing map, albeit with several kinds of church-grouping models likely to be employed. 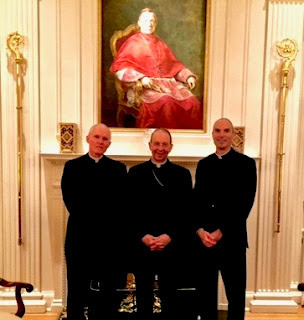 Together with that shift, after several years of attempting two regional vicariates to cover the massive turf – which stretches from the Chesapeake to the Free State’s western mountainland – the arrival of twin auxiliaries will see a return to the prior practice of three vicariates. In tandem with this morning’s appointments, the Pope granted the retirement of Bishop Denis Madden 21 months after he turned 75. The lone active auxiliary in Ravens’ Country since 2013 (when Bishop Mitch Rozanski was transferred to Springfield, Mass. ), the eminent ex-Benedictine – a figure regarded in some quarters as a living saint – is expected to remain heavily involved both with his cherished ecumenical and interfaith work, as well as keeping a significant role in the urban ministries of the archdiocese. In other words, Denis is still Denis – and, indeed, not even the Pope can change that. On a historic note, today’s nods represent the first dual appointment of Baltimore auxiliaries since 1984 – a cycle which involved another pioneering “ethnic” choice, as the Josephite John Ricard (then also based in Washington) was named the Premier See’s first African-American bishop. Seriously, Hons, did you really think we would miss this? More soon.